The Human Eukaryotic Release Factor, eRF1, plays a vital role in stop codon recognition3. Unlike its prokaryotic counterparts, RF1 and RF2, eRF1 recognizes all three stop codons rather than requiring separate release factors for each stop codon3. Though eRF1 works in concert with the release factor eRF3, eRF1 alone is sufficient to promote termination in mammals. In contrast, eRF3 requires eRF1 in order to hydrolyze GTP. 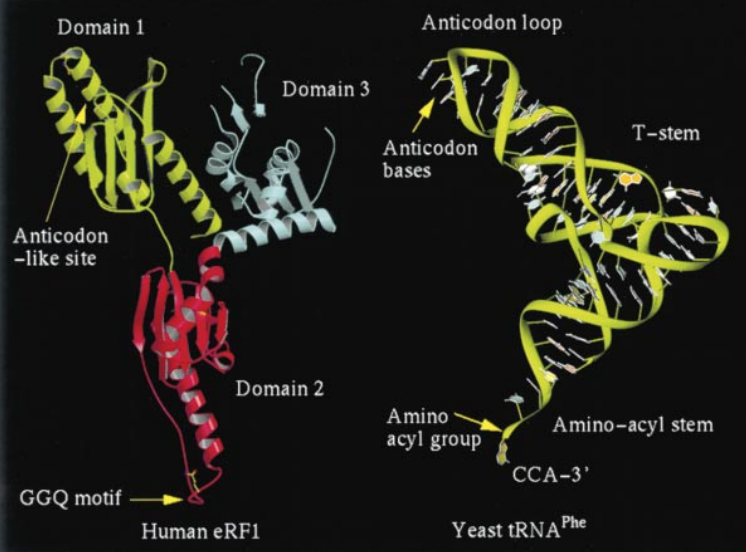 As a class 1 release factor2, eRF1 is a tRNA mimic; its three are analogous to the structures of the anticodon stem, aminoacyl stem, and T stem of a tRNA during protein synthesis2,6 (Figure 1; more information in the General Structure section). Figure 1. Molecular Mimicry of tRNA Molecules, from Song et al. Both in structure and function, eRF1 has striking similarity to a tRNA molecule6,2. Structurally, eRF1 and tRNA are similar in both width and thickness, although eRF1 is longer than tRNA2. 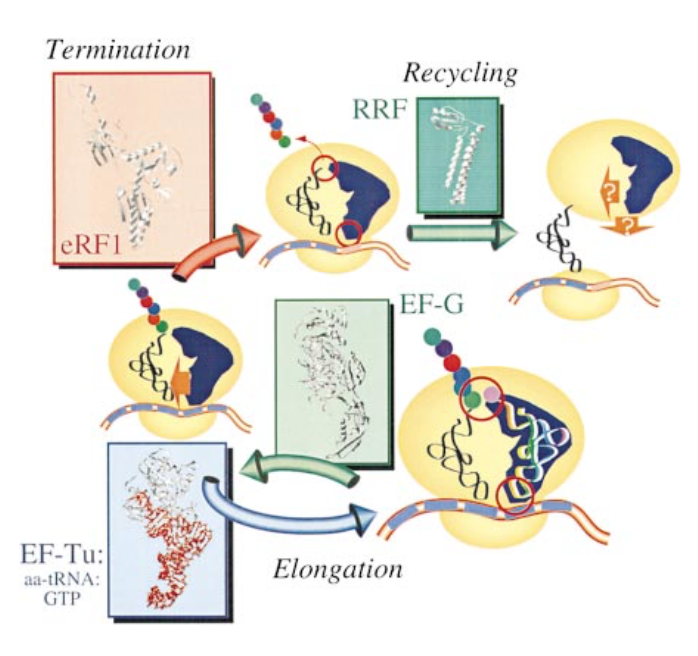 Functionally, eRF1 and tRNA behave similarly, both interacting at the peptidyl transferase center of the large ribosomal subunit, recognizing mRNA codons within the small ribosomal subunit, and associating with a GTPase: eRF3 for eRF1 and EF-Tu for tRNA2 (Figure 2). Figure 2. tRNA Mimicry During Protein Synthesis, from Nakamura et al. Each domain has a distinct function. Domain 3, or the of eRF1, interacts with the C terminal of eRF3. Domain 2, or the , contains the highly conserved GGQ (Gly-Gly-Gln) Motif and therefore plays a significant role in tRNA release2,4. The stop codon decoding site of eRF1 can be found in a highly conserved region of domain 1, also called the . This domain also contains the , which forms a loop between the alpha-2 and alpha-3 and may play a role in ribosome binding and stop codon recognition7,5,4. These two alpha helices form an antiparallel helix hairpin against a layer of , creating a groove which is thought to play a role in codon recognition1,2. The distance between this site and the GGQ motif in eRF1 closely matches the distance between the functionally equivalent sites of tRNA, again demonstrating close structural and functional similarity between the two molecules2. Finally, it’s important to note that while we can see clear structural similarity between eRF1 and tRNA, the relatively few interactions between domain 2 of eRF1 and the rest of the molecule suggests conformational flexibility within the domain2,3. This flexibility implies that the conformation of the crystal structure may differ from the conformation of the protein when bound to the ribosome or in complex with eRF3. Functionally, however, the two molecules behave similarly, regardless. The is a highly conserved component of eRF1s made up of a sequence of .2 It is thought that this motif, at the tip of Domain 2, plays an important role in mediating the hydrolysis of the peptidyl-tRNA2. A network of between Arg-189 and Ser 186 helps stabilize the conformation of the residue2. Interaction with the peptidyl transferase center happens in eRF1 at the GGQ motif5. At the ribosomal P site, GGQ forms a peptidyl-tRNA bond via hydrolysis by a catalytic water molecule coordinated by Gln-185 of eRF1 located in site A2. The activity of GGQ here is equivalent to that of the aminoacyl group attached to the CCA-3’ sequence of the aminoacyl stem of a tRNA molecule2. Furthermore, the position of the GGQ motif on the tip of an within domain 2 of eRF1 suggests that domain 2 as a whole is the structural counterpart of the aminoacyl stem of tRNA2. Interactions between eRF1 and eRF3 occur in domain 3 of the protein from residues . An intact domain 3 is crucial for this interaction5. , one of the central beta strands, is responsible for stabilizing the domain. As a result, beta-15 is critical for the interaction between eRF1 and eRF32. In yeast, another key binding site for eRF3 occurs on the extreme C terminus of the protein. However, the residues comprising the C terminus of eRF1 in human eRF1 are disordered and as such the C terminus has been demonstrated to be unnecessary for human eRF1 and eRF3 interactions2. 1. Bertram G, Bell HA, Ritchie DW, Fullerton G, Stansfield I. 2000. Terminating eukaryote translation: Domain 1 of release factor eRF1 functions in stop codon recognition. RNA. 6:1236-1247. 2. Song H, Mugnier P, Das AK, Webb HM, Evans DR, Tuite MF, Hemmings BA, Barford D. 2000. The crystal structure of human eukaryotic release factor eRF1--Mechanism of stop codon recognition and peptidyl-tRNA hydrolysis. Cell. 100:311-321. 3. Matheisl S, Berninghausen O, Becker T, Beckmann R. 2015. Structure of a human translation termination complex. Nucleic Acids Res. 43: 8615. 4. Dubovaya VI, Kolosov PM, Alkalaeva EZ, Yu L, Frolova, Kisselev LL. 2006. Influence of individual domains of the translation termination factor eRF1 on induction of GTPase activity of the translation termination factor eRF3. Molecular Biology. 40(2):270-275. 5. Kisselev L. 2002. Polypeptide release factors in prokaryotes and eukaryotes: same function, different structure. Structure. 10:8-9. 6. Nakamura Y, Ito K, Ehrenberg M. 2000. Mimicry grasps reality in translation termination. Cell. 101:349-352. 7. Frolova L, Seit-Nebi A, Kisselev L. 2002. Highly conserved NIKS tetrapeptide is functionally essential in eukaryotic translation termination factor eRF1. RNA. 8:129-136.